With commitment and professionalism we have created a reality in Taranto specializing in the marine engine inboard and within / outside edge for yachting, combining the sale of articles and equipment for boating. Our headquarters alongside a workshop stocked shop where you can buy nautical hardware, accessories, aircraft instrumentation, marine engine spares, spare parts for boats and for all on-board equipment. Our large warehouse is equipped with spare parts and equipment ready for installation, so that we can provide assistance and advice mounting even to amateurs and hobbyists. We also offer customers a mobile workshop, in fact, our technical specialists with decades of experience in the field can reach the ports of Puglia and Basilicata. 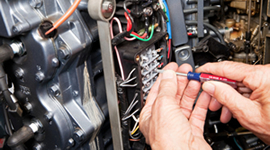 We have a workshop for the repair, maintenance and service of marine engines. We are able to intervene and restore the functionality of the engines and the maintenance of motors within or outside edge. The vast experience and continuous professional development allow us to intervene in a targeted and precise, to solve the specific problems of each engine. 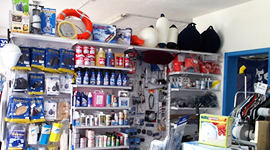 Our shop is open to the public and retailers, is provided with spare parts for engines, filters, oil, belts, batteries, tools and accessories for boats. We esposizioneprodotti in maintenance for the boat, spare parts, accessories and gadgets for boating. Our mobile workshop is equipped for operations in ports, operating maintenance engines of your boat wherever in the Ionian. You will find in us not only the mechanics, but the faithful counselors who can give advice to lengthen the life of your engine with the least expense. We carry out the installation of accessories and tools for your boat: batteries for boating, cooking electric or gas, refrigerator, toilet with holding tank systems, power generators, hydraulic gangways external, embedded systems GPS - VHF - fish , digital and satellite TV systems, battery chargers, inverters, additional water tanks, fuel tanks replacements and more. At our office you will find highly qualified staff can provide advice and recommendations to choose which accessories or engines to be installed on your boat. We will help you choose the most suitable product thanks to professionals who will guide you to the best. In our services you will also find the repowering, the Wintering, scheduled maintenance and service coupons for your motor boat. We handle all legal procedures for revision of safety certificates of the boats, renew licenses and documents required for the proper navigation.